In 1981, Napa Valley was designated as the first American Viticultural Area (AVA) in California. AVAs in the United States are similar to the Appellation system in Europe, used to legally define and protect a geographical designation. Our Napa Valley AVA listings includes 16 unique Sub-AVAs with distinct microclimates and terrain exist. Together they produce just 4% of California’s wine and occupy an area that is 30 miles long and five miles wide, about 1/8 the size of Bordeaux (the largest wine growing area in France). The world-class wine grapes of the Napa Valley AVAs are a product of diverse soils, climates, and topographical conditions. Located northeast from the city of Napa, Atlas Peak has an elevation of 760-2000 feet and is ideal for producing explicit Cabernet Sauvignon and Chardonnay wines. The peak of this mountain offers temperatures about 15-20% cooler than the valley floor during the summer months. It is above the fog line and the soil is volcanic and very porous; this allows it to cool down quickly. Calistoga AVA is known for its volcanic soil and bedrock. Days are hot (up to 100 degrees), which provides abundant color and flavor in the wines. The nights cool down, which helps to maintain the acidity and structure of the wine. At 300-1200 feet (located in the northern part of the Napa Valley appellation), this AVA is successful at making distinct and celebrated Cabernet Sauvignon, Zinfandel, Syrah, and Petite Syrah wines. Nestled in the Vaca Mountains on the northeast side of Napa County is the Chiles Valley District, reaching 600-1200 feet. This AVA has warmer temperatures than some, and produces outstanding Cabernet Sauvignon, Merlot, and Cabernet Franc wines. Coombsville AVA is located to the east of Napa and is close to San Pablo Bay, which influences the temperate climate of this area. Vineyards are grown in the 100-500 feet range, and a small amount of vines extend beyond 1000 feet. The wines produced from the lower, cooler areas of this AVA include Merlot, Chardonnay, Syrah, and Pinot Noir; the hillside grapes create amazing Cabernet Sauvignons. Located on the Mayacamas Mountains in the northwest portion of Napa Valley, the Diamond Mountain District is considered a mountain AVA. It is a 450-acre, steep-sloped area with elevations ranging from 400 ft. to 2,200 ft., resulting in less cool fog and more direct sunlight than other regions. The primary varietals from this AVA are Cabernet Franc, Cabernet Sauvignon, Malbec, Merlot, Petit Verdot, and Sauvignon Blanc. Howell Mountain holds the distinction of the first Sub-AVA in greater Napa Valley and was home to some of the most successful winemakers during the boom of the 1880s. This 600-acre area located on the Vaca Mountains has elevations between 1,400 ft. and 2,200 ft., receiving cool breezes from San Pablo Bay but avoiding the fog. Howell Mountain produces the following excellent mountain wines: Cabernet Franc, Cabernet Sauvignon, Chardonnay, Grenache, Malbec, Merlot, Petit Verdot, Petite Sirah, Suavignon Blanc, and Zinfandel. 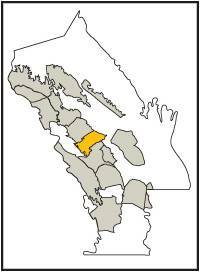 The Los Carneros AVA straddles Sonoma and Napa Counties and is located just north of San Pablo Bay. It is a cooler climate, resulting in cooler climate varietals like Chardonnay and Pinot Noir. The region has more than 1,300 acres of vineyards and most of its grapes are used for sparkling wine production. Other varietals from the region are Albarino, Barbera, Chardonnay, Dolcetto, Gerwurztraminer, Grenache, Marsanne, Merlot, Muscat Canelli, Nebbiolo, Pinot Blanc, Pinot Gris, Pinot Meunier, Pinto Noir, Riesling, Roussanne, Sauvignon Blanc, Syrah, Tempranillo, Tocai Friulano, Vernaccia, and Viognier. Mount Veeder is a 1,000-acre, 25 square-mile, steep-sloped appellation with volcanic soil. This unique terrain produces powerfully structured, bold wines. The principle varietals of this region are Cabernet Franc, Cabernet Sauvignon, Chardonnay, Malbec, Merlot, Petit Sirah, Syrah, Viognier, and Zinfandel. The Oak Knoll District is the most diverse winegrowing appellation in Napa Valley, with over 18 grape varietals planted on 8,300 acres. There is less rainfall in this region than other parts of the valley, resulting in warmer soil, longer “hang time,” and ample ripening of the grapes. Oak Knoll’s grape varietals are Merlot, Chardonnay, Cabernet Sauvignon, Pinot Noir, Cabernet Franc, Malbec, Riesling, Syrah, Voignier, and Zinfandel. Oakville, located in the heart of Napa Valley, is a 5,700-acre area, 5,000 of which is planted vineyards. That’s a lot of grapes! This appellation has the greatest concentration of distinguished Cabernet Sauvignon producers in Napa Valley. Oakville’s climate is a splendid mixture of the cooler influence from the Bay and the warmer inland air, and the area receives about 35 inches of rain per year. In addition to its renowned Cabernet Sauvignon, the region produces Merlot, Cabernet Franc, Petit Verdot, Zinfandel and Sangiovese, and white varieties like Chardonnay and Sauvignon Blanc. Rutherford is situated between Oakville and St. Helena and produces many distinguished wines. At altitudes between 100 ft. and 500 ft., the region gets the cool breeze and morning fog from the San Pablo Bay and receives about 38 inches of annual rainfall. Wines produced from this region are Cabernet Sauvignon, Merlot, Cabernet Franc, Chardonnay, and Sauvignon Blanc. Spring Mountain is the coolest and the wettest Napa Valley appellation, and its vineyards represent less than 2% of the valley’s wines. It is an 8,600-acre area on the eastern slopes of the Mayacamas Mountains. The harsher conditions create extra stress on these vines, producing long-lived wines that are intense in character. The primary varietals of this region are Cabernet Sauvignon, Merlot, Cabernet Franc, Zinfandel, Petit Verdot, Syrah, Petite Sirah, Pinot Noir, Chardonnay, Sauvignon Blanc, and Riesling. This small region, consisting of 2,700 acres, is three miles long and scarcely a mile wide, yet it produces world-renowned Cabernet Sauvignon and other legendary wines. Temperatures in Stags Leap rise quickly but cool down significantly at night, providing the perfect conditions for late-maturing varietals. Cabernet Sauvignon is the signature varietal of this region but Stags Leap also produces limited amounts of Petite Syrah, Merlot, and Sangiovese. The history of St. Helena dates back to 1875 and it is a historic Napa Valley community, just 400 ft. above sea level. Because it gets protection from the western hills, the climate is warm. Annual rainfall in this area is between 38 to 40 inches, with moderate retention from the clay soil. Principal varietals of this region are Cabernet Sauvignon, Cabernet Franc, Merlot, Syrah, Viognier, Zinfandel, and Sauvignon Blanc. Wild Horse Valley is Napa’s smallest AVA, with a mere 70-acres of vineyards. The region spans Napa and Solano counties and is ranges from 400 ft. to 1,500 ft. Temperatures are moderately warm with annual rainfall around 35 inches. The volcanic soil of this region produces intensely flavored Pinot and Cabernet Sauvignon as well as crisp, floral Chardonnay. Yountville, one of the lesser talked about appellations, has a diverse mixture of distinct soil types and a unique topography that traps the cool marine breezes, extending grape hang time. Its elevations range from 20 ft. to 200 ft. Half of Yountville’s 8,000 acres is planted vineyards. Though Yountville favors Cabernet Sauvignon and Merlot, other varietals from the region are Cabernet Franc, Chardonnay, Gewurztraminer, Malbec, Petit Verdot, Petite Sirah, Pinot Blanc, Pinot Noir, Sangiovese, Sauvignon Blanc, Syrah, and Zinfandel. Not sure which area of Napa Valley to tour? Take a moment to check out Beau Wine Tours’ specific routes, including our Napa Valley Wine Tours, Intro to Napa Valley, Discover Coombsville Tour, Spring Mountain Wine Tours, Howell Mountain Wine Tours, and Diamond Mountain Tours. For the wine connoisseur, our Collector’s Tour may be the perfect match. Enjoy! If you are looking for a more economical Napa Valley group wine tour experience, check out our Daily Napa Valley Limo Tours. For wine tour bus and shuttle service, check out our Napa Valley Wine Tour Bus and Luxury Shuttle Service.